First: If you are in reasonable driving range of Salem, hasten yourself to their new World of Wearable Art exhibit sometime between now and June. Catherine and I went to the opening today and were blown away. 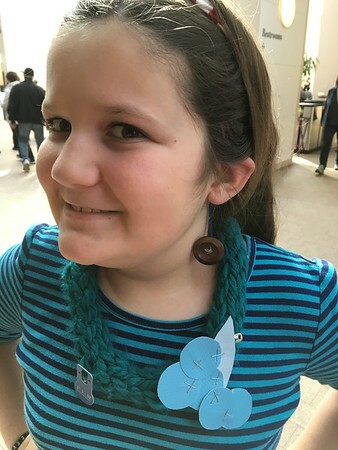 Second: Check out those earrings that Catherine made at an upcycling, wearable art workshop! They have wire hoops that hook around her ear, making them ideal for her non-pierced ears. This entry was posted in 2017 Pic a Day on February 18, 2017 by Rebecca.